I have been experimenting with my blog and have decided to move it to a new provider. As a result all new content (and most of what is here) will now be located at: Anders’ Kitchen Adventures. Thanks for visiting, please check out my new site. I use these bath bags to soothe my skin when I am feeling hot or itchy. They are useful if you have eczema or another skin condition. You can add various different herbs depending upon what you prefer. Other than the ones I have used, Calendula or Gotu Kola are also supposed to be soothing and cooling. If you have dry skin you could also try adding 20mL of almond oil to the bath. 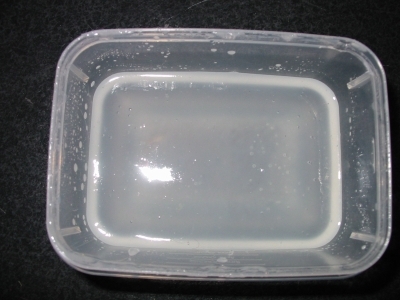 Shake the oil with water in a small container so that it emulsifies before you put it in the bath. 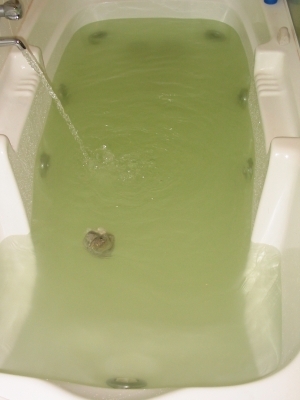 This stops the oil from sitting on the surface of the bath in a layer. Mix all the ingredients, and place into the muslin. Gather the ends of the muslin, and tie into a bag with string or a rubber band. Make the bag loose so that there is room for the contents to expand when they are added to the water in the bath. Place the bag into your bath while you run it. To assist the ingredients to be released, you can squeeze the bag a few times. You may be surprised how fragrant and relaxing this bath is. Take care not to fall asleep! Sit in the bath for 10 to 20 minutes and make sure that you splash the bath onto your face and over your head for the full benefits. The good thing about home made hair gel is that you know the ingredients. This makes it a better choice for people with sensitive skin or eczema. You can add which ever scented oils you prefer, but I have used lavender as it has a pleasant relaxing fragrance. If you have trouble obtaining the ingredients you may need to order them online. I have purchased them from Auroma, who are based in Australia. This recipe does not have the extreme hold of some of the commercial products, but it will hold badly behaved hair in place. Warm the glycerine, and dissolve the tragacanth gum. Add the mixture to the water with a few drops of lavender oil and blend until smooth and thick. This can be used immediately, and will keep in the refrigerator for some time. Bechamel Sauce made without Cows Milk and wheat flour does taste different. This sauce is made with rice milk, which does have a sweet taste, however it can be used in recipes such as lasagna where there are other flavours. It may also help to add some salt or mustard to reduce the sweetness. Put the milk, vegetables, bayleaf and peppercorns into a saucepan, bring to a gentle simmer then turn off the heat. Leave milk for flavours to infuse then strain. Melt the margarine then add the cornstarch, stirring until smooth. Slowly stir in the milk over a low heat. Once all the milk has been added keep stirring until the desired consistency has been reached. Taste the sauce, if it is too sweet you can add some mustard or salt to counteract. 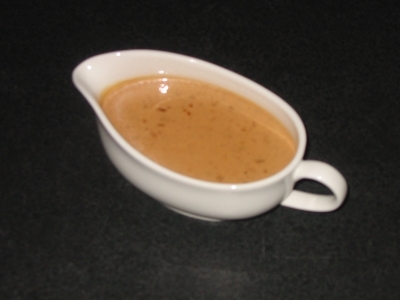 Peanut Sauce is a tasty sauce that can be used with meats, salads and vegetables. It is commonly served with Satays and with the salad Gado Gado (recipe soon). This sauce will keep for a few days in the refrigerator. It makes enough for a meal for 4 people. gently cook the onion in oil until soft and browned. add garlic and shrimp paste and fry until fragrant. add the peanut paste and stir until softened. add the coconut milk and stir until blended, then remove from heat. add the remaining ingredients and mix. check the flavour after adding 1/2 lemon juice and add more if needed. Add extra water or coconut milk (a small amount at a time) until it is the desired consistency. Slow cookers have been around for years, and some people refer to them as a crockpot. That name seems to have some connotations of tasteless mush, however the slow food movement advocates cooking food slowly to extract maximum flavour and tenderness. 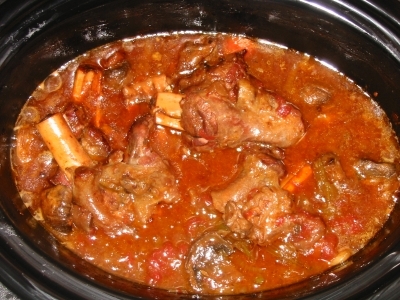 These shanks were one of the first things I cooked in my cooker after I purchased it. I left the cooker on for 10 hours as an experiment to see how it would work if I left it on while at work. The moisture level hardly changed at all, so I know that I will not have to worry about the cooker drying out and burning down the house! The shanks themselves were melt in the mouth soft, and literally fell off the bone. This recipe serves four. Don’t worry about the large quantity of garlic, when cooked this way the garlic almost tastes creamy and is far more delicate that when chopped and sauteed. This arabic dish is also known by the name Foul, however it definately does not tast foul! The recipe is very easy to make, and you can adjust the seasoning to suit your taste. Cook the beans for a few minutes, until hot. Drain, then add garlic, and mash until a thoroughly mixed paste. It doesn’t matter if you can still see the fava bean skins. Add lemon juice and tahini and mix thoroughly. Gradually mix in water until a soft dip like consistency is achieved. Season to taste, and garnish with olive oil and parsley. Serve this with pita bread, or chopped vegetables to be used as a dip. Delicious and healthy.